WinMOD-SIMLINE Libraries - WinMOD - virtual commissioning and more! : WinMOD – virtual commissioning and more! 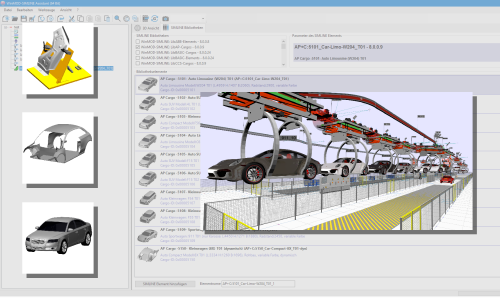 With WinMOD-SIMLINE Libraries, real conveyor systems are virtualized. Parameterisable components of conveyor technology, sensors and transported goods enable the realistic WinMOD-SIMLINE real-time material flow simulation. The following describes the currently available WinMOD-SIMLINE Libraries. Other libraries are in preparation. 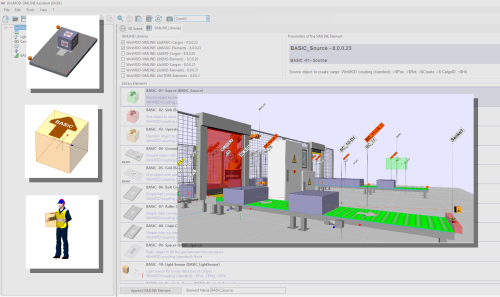 The WinMOD-SIMLINE Library Basic Elements (BASIC) provides functional elements such as source, sink, various sensors and scanners, also the other visual design elements such as equipment labels, fences, frames, etc. This library is the standard part of the WinMOD-SIMLINE system and is delivered by default. The WinMOD-SIMLINE Library Container Conveyor Technology (CCS) is used to create sorting picking systems for containers, cartons and other small-sized goods. In addition to the classic roller conveyors and converters, there are the typical cam roller conveyors, belt curves and accumulation roller conveyors. All elements are completely parameterizable. In addition to a number of typical container and carton goods, however, it is also possible to integrate individual objects from bottles to pack trays then to machine components. Includes everything you can sort, pick and pack. Real conveyor systems can be created with absolute precision in WinMOD-SIMLINE. Not only the real dimensions are correct, but also the mechanical entanglements/connections and thus the exact number of required electrical components. The WinMOD-SIMLINE Library Pallet Conveyor Technology (PCS) contains all the elements required to generate sorting, picking and palletizing systems as a functional WinMOD-SIMLINE System. The elements range from simple roller conveyors, through corner-combiner combinations, to various empty pallet dispensers and are all completely configurable. 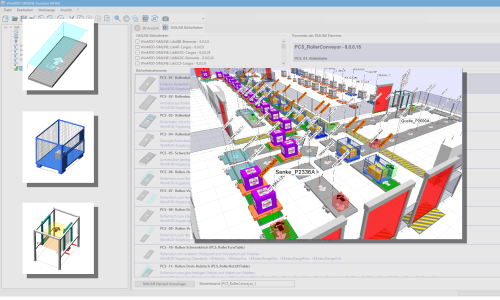 For palletizing systems, the combination with the WinMOD-SIMLINE robotics libraries is possible. 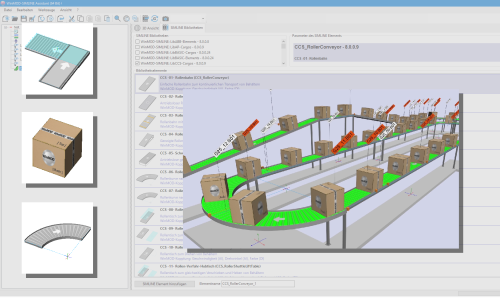 Real conveyor systems can thus be created with absolute precision in WinMOD-SIMLINE. Not only correct dimensions but also precise mechanical entanglements and thus the exact number of required electrical components. An extensive number of typical transport goods is also included. 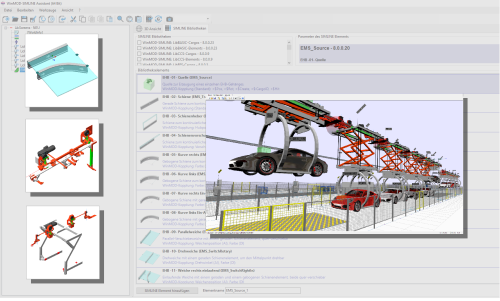 The WinMOD-SIMLINE Library SKID Conveyor Technology (SKID) has been specially designed for the automotive industry and makes it possible to integrate areas ranging from connecting conveyor technology in body construction via painting lines to complex MAT routes and sorting memories as a WinMOD-SIMLINE System. The library includes simple roller conveyors, converter combinations, chain conveyors, empty SKID dispensers and linear units with handling functions. All elements are completely parameterizable and combinable. From the first bodyshell to the finished car, all conveying processes and process transitions in WinMOD-SIMLINE can be realized. An extensive number of typical SKID modules and standard bodies enable the immediate start of a WinMOD-SIMLINE System without having to wait for 3D CAD data. If necessary, individual CAD-based SKID modules can be integrated at any time. Thus, the geometrically accurate sensor detection is ensured especially with MAT systems. 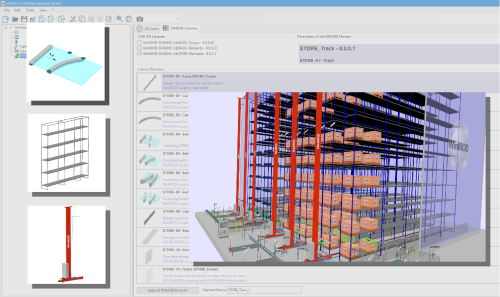 The WinMOD-SIMLINE Library Storage Systems (STORE) makes it possible to generate automatic warehouses completely as a WinMOD-SIMLINE System. The travel distances of the stacker cranes are parameterized via ground rail elements such as straight lines, curves and turnouts. Standard storage and retrieval machines can be individually adapted to the respective real stacker cranes, in particular, the rail and code tape readers. In addition, there are various load handling devices for the possible lifting and gripping mechanisms. The shelves themselves are also created using parameterizable elements with frame size, number of storage levels or locations. 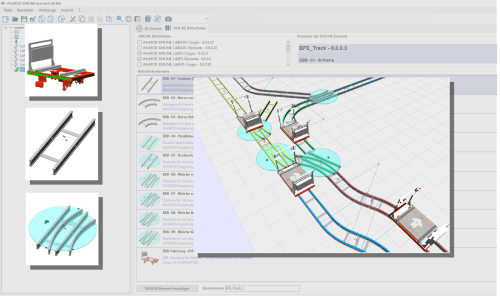 The WinMOD-SIMLINE Library for Electric Monorail System (EMS) contains all the necessary elements to generate a functional WinMOD-SIMLINE System for a given track layout. For this purpose rails, curves, various types of switches, as well as rail lifts and travel modules, are parameterized constructively and functionally. The WinMOD-SIMLINE connection point system also makes it possible to easily and quickly create complicated routes, whether with gradients, floor changes or alternating curves. Therefore, the first validation of the rail layout in the WinMOD-SIMLINE 3D environment can be taken care. The WinMOD-SIMLINE Library contains standard EMS vehicles for light and heavy-duty applications. These include, for example, the typical combinations of lifting and swing frames to simulate the processes in assembly lines or the conversion to other production sites as in the real process. For this purpose, manufacturer-specific EMS vehicles can be individually virtualized and also CAD-based design elements, components or bodies can also be integrated. WinMOD-SIMLINE sensors for vehicle and component detection and parameterizable rail and code tape communication make it possible to simulate every real EMS system type. The WinMOD-SIMLINE Library for Electric Floor System (EFS) contains all the necessary elements to generate predefined rail layouts as a WinMOD-SIMLINE System. The double floor rails with straight lines, curves and points are configured constructively and functionally. Standard and manufacturer-specific vehicles can be individually virtualized. The classic WinMOD-SIMLINE conveyor technology can then be used to install the necessary „on-board“ technology such as roller or chain conveyors and sensors on the vehicles. The rail and code band communication make it possible to simulate every real EFS system type. The WinMOD-SIMLINE Library for Automotive Parts (AP) contains elements such as side panels, doors, front flaps, etc. for automotive engineering. 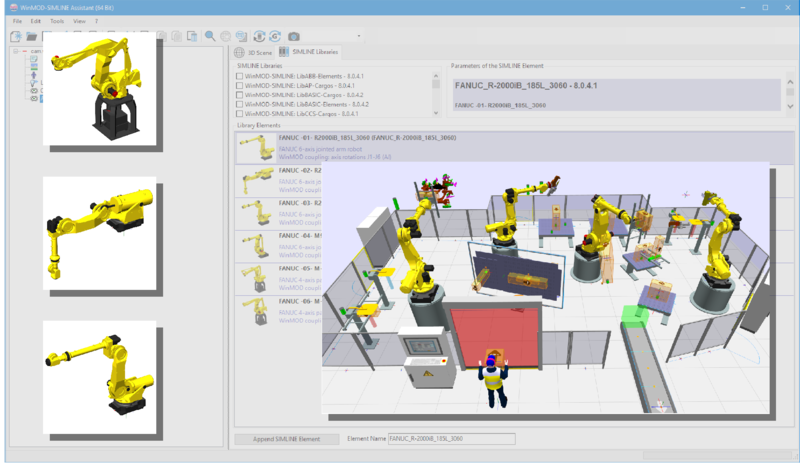 The WinMOD-SIMLINE robot libraries for ABB, KUKA and FANUC contain many different robot models according to the real models. The 6-axis articulated arm robots form the basis but also palletizers with compensation mechanics or small robots for pick-on-place of small parts are available. The gripping and handling devices on the robot head can again be realized by parameterizable elements from the robot environment libraries. An enrichment of the devices with the individual 3D CAD data is possible at any time. The piece quality is measured again with the WinMOD-SIMLINE sensors. 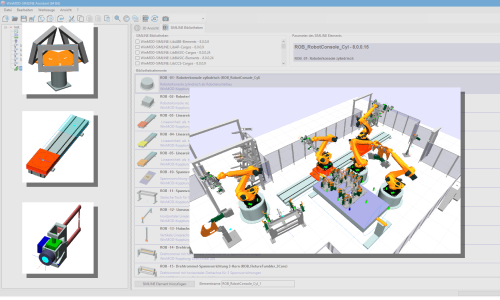 The WinMOD-SIMLINE robot libraries for ABB, KUKA and FANUC contain many different robot models according to the real models. 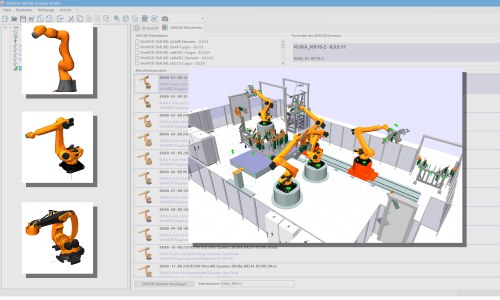 The 6-axis articulated arm robots form the basis but also palletizers with compensation mechanics or small robots for pick-on-place of small parts are available. The gripping and handling devices on the robot head can again be realized by parameterizable elements from the robot environment libraries. 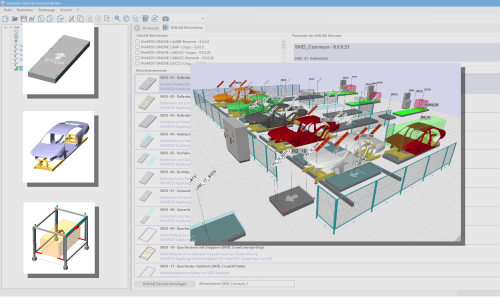 An enrichment of the devices with the individual 3D CAD data is possible at any time. The piece quality is measured again with the SIMLINE sensors. 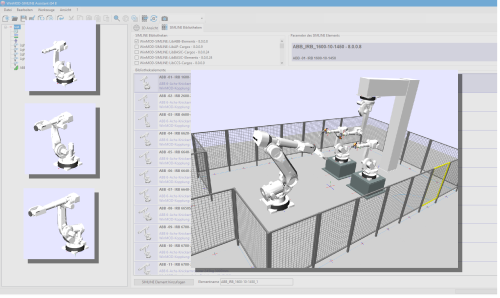 The WinMOD-SIMLINE Library for the robot environment (ROB) contains elements such as 6-axis articulated-arm robots, gripper frames, linear units, clamping devices, etc.